Established in 2001 as the parent company of Coach (itself established in 1941), Coach Inc. is a New York-based house of modern luxury lifestyle brands that includes its eponymous flagship brand (Coach), shoe label Stuart Weitzman (acquired in 2015), and fashion label Kate Spade New York (acquired in May of this year). 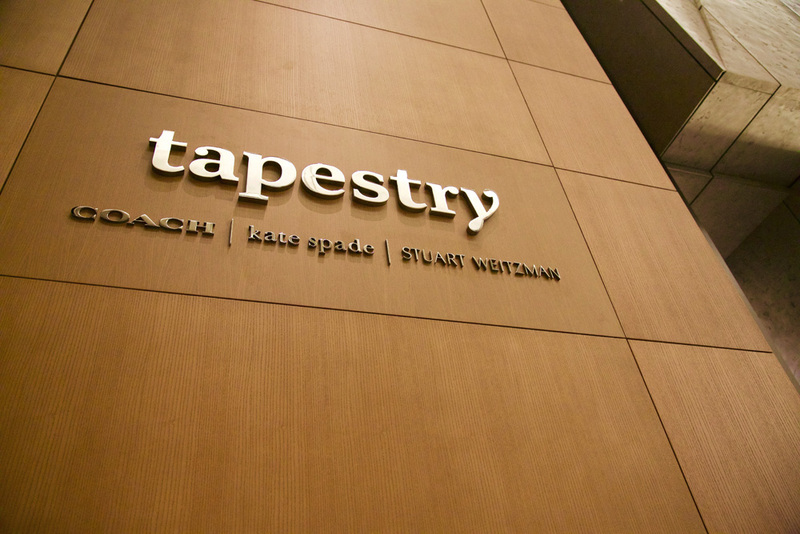 This last addition prompted the recent name change to Tapestry, allowing the company to potentially acquire more brands in the future without weighing them with the Coach name. The new name — in collaboration with naming agency PS212 — and identity change were led by New York, NY-based Carbone Smolan Agency. The company’s vision of becoming a house of brands became a reality with the acquisition of its third brand, kate spade new york. With this acquisition, it became something much larger than its name could hold. The company needed a new name to signal this change and leave room for other unique brands to join. CSA wanted to find a name that was true to the company values of being optimistic, innovative and inclusive, as well as express the diversity of its employees and brands. 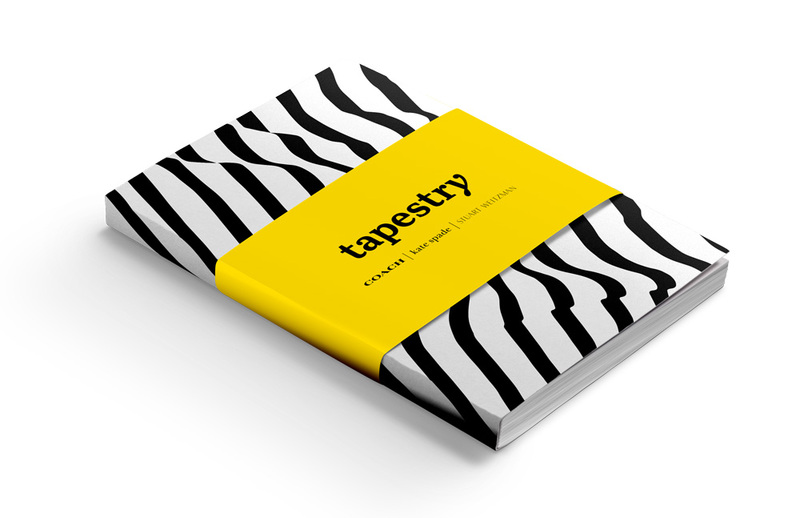 The selected name, Tapestry, perfectly fits the brand’s character and has the flexiblity to grow with the house as it expands across categories and geographies. With the growth of its portfolio of brands — especially one that includes a name as recognizable as Kate Spade — and their intention to keep up that trend, the Coach Inc. name was too much of a burden for the sub-brands and perhaps made it seem like they would all have to switch to selling bags and gloves. 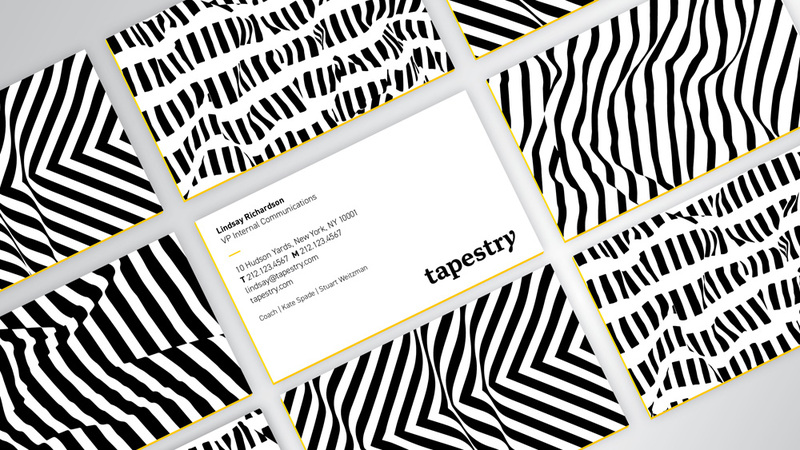 Moving to a broader name allows Tapestry to acquire brands in other categories and expand its offering. It’s a good name in that it relates to fashion/fabrics and conveys the idea of a whole made up of smaller parts. It’s also somewhat baffling that the name was still legally available. 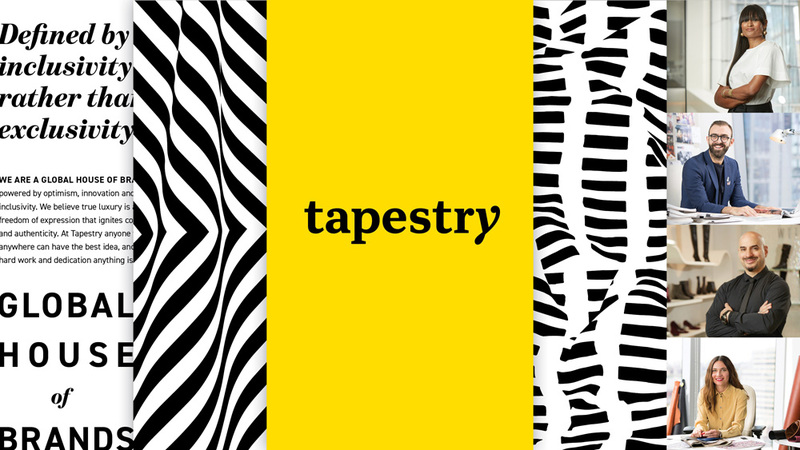 The Tapestry logo telegraphs stability with room for individuality and expression, befitting of a company that investors can believe in, that brands can imagine being a part of, and one that invites employees in. The letterforms create a strong, stable visual rhythm punctuated by the spirited upward gesture of the “y”. Tapestry Yellow is happy and welcoming and optimistic—all attributes that are true to the brand and the people who are helping to build it. It’s bold and bright and stands-out in a crowd. The old logo lives on in the consumer brand so no point in rhapsodizing about it. The new logo is a handsome wordmark in a bold serif — OMG! — with a swash “y” punctuating it. I personally would have loved to see an uppercase “T” at the beginning and have the logo avoid all current trends but I definitely like its aesthetic and how it stands apart from its sub-brands both complementing them and being different from them so as not to play favorites or tie in more or less with any of them. At first, the “y” is a little hard to digest, since it changes somewhat abruptly from a regular serif to a script italic serif all in the same character. BUT, we all talk a lot about logos not having any points of distinction anymore and this little flair at the end of the logo does just, adding a visual spark to make it stand out. The patterns are bold, fresh, and lively. Their fabric-like movement is strong but can flex and move and adapt without breaking. The yellow accent color is somewhat surprising, as it’s not the first color that comes to mind when thinking of fashion. Perhaps it’s an ode to the company’s New York-ness and plays on the color palette of the city’s taxis. It does pair well with the black and white patterns which I really like as graphics but feel a little untamed and wild in contrast with the more buttoned up brands it represents. Perhaps if the patterns were in more muted colors it would be more in line with the idea of luxury brands. Launch video. Directed by Dan Covert of Dress Code. Overall, it’s a positive change — especially business-wise — and, in the end, Tapestry will be a relatively less visible corporate brand than its consumer brands but it definitely sets the groundwork for a growing fashion enterprise that has an approachable personality and not some monolithic corporation out there gobbling up existing brands. Established in 2001 as the parent company of Coach (itself established in 1941), Coach Inc. is a New York-based house of modern luxury lifestyle brands that includes its eponymous flagship brand (Coach), shoe label Stuart Weitzman (acquired in 2015), and fashion label Kate Spade New York (acquired in May of this year). 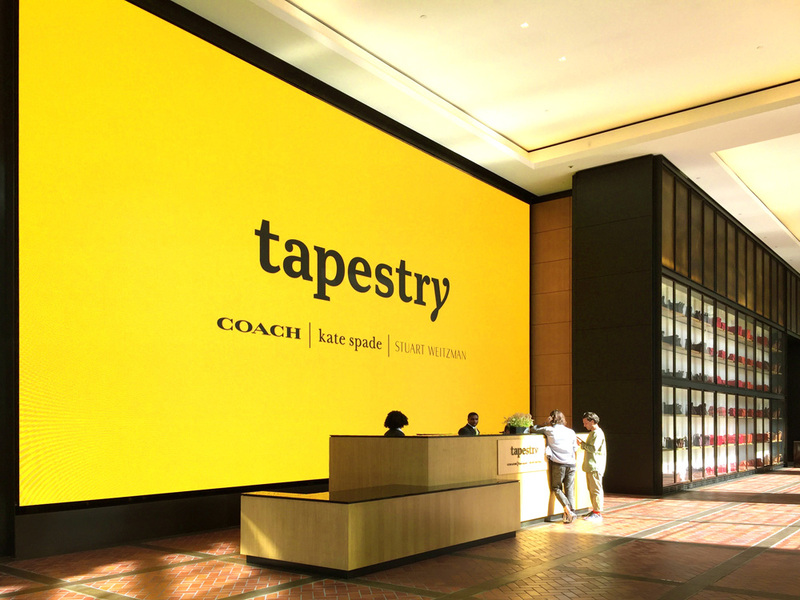 This last addition prompted the recent name change to Tapestry, allowing the company to potentially acquire more brands in the future without weighing them with the Coach name. The new name -- in collaboration with naming agency PS212 -- and identity change were led by New York, NY-based Carbone Smolan Agency.